We keep on receiving news from our artist friends that we would like to share with you. This time, it is a postcard by César Bardoux from his studio in Paris where he pursues his studies at the Beaux Arts. César exhibited in Providence a while ago and more recently at the Pension Marienia in Guéthary. You know, he is the handsome young man with peroxidized blond hair that you may have bumped into in Guéthary streets with his surfboard, or who surely served you one or two beers this summer at Providence! 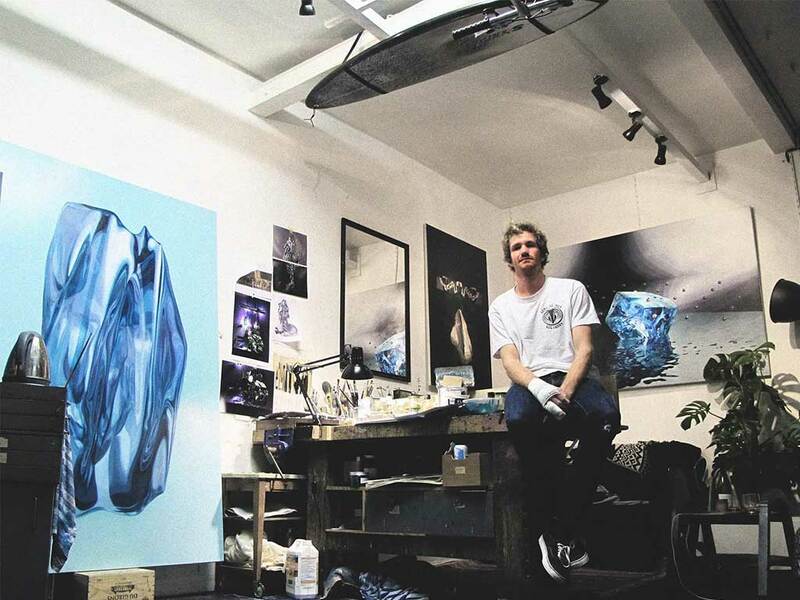 He is currently working on amazing projects, where we can find the shades of blue from the ocean he cherishes. His work is to follow on his account instagram @cesarbardoux. I miss your calm and cozy atmosphere very much, especially since I left you last October. I left you to return to get back to work and finish my last year of studies at the Beaux Arts in Paris. After so many good moments at your place, I can tell you to get back to the capital was troubling. I work intensely but I think very often about you. I will present my degree in June; it will mainly be large vertical oil paintings as well as some volumes in resins and plastics. Everything is still a bit fuzzy at the moment. I always work with shades of blues, a very soothing palette that brings me back to the ocean. I think I found the title of my exhibition, but it may change: “Almost transparent blue” is the title of a novel by Murakami, but there is no relation to my work. I find that this title expresses well the different themes of my research: the pictorial interpretations of the material confrontations, mainly organic and mineral materials but also synthetic. For my compositions I have worked for 1 year using 3D software: I scan and modelize my elements and then, once the image built, I try to paint it. I am doing a little break in my work and I am preparing a drawing for a collective exhibition planned in March at Galerie Da end, located in Paris 6th. Unfortunately, I broke my right hand so it does not make the task very easy but I take it as a challenge.